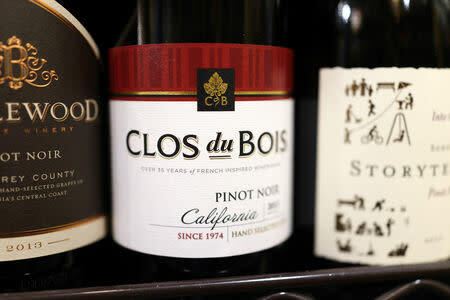 (Reuters) - Constellation Brands Inc <STZ.N>, the U.S. producer of Corona and Modelo beers, is looking to sell some of its U.S.-based wine brands, in a deal that could be worth more than $3 billion, according to four people familiar with the matter. Constellation, the third-largest brewer in the United States behind Anheuser-Busch NV <ABI.BR> and MillerCoors, has hired investment bank Goldman Sachs Group Inc <GS.N> to explore the divestitures, the sources said on Monday. "We are also considering a variety of potential actions to optimize value at the low end of our portfolio, so we can direct our growth efforts and investment dollars more fully towards our focus brands," the Constellation spokesman added in the statement. Meanwhile the company has also been expanding in the legal marijuana industry, splashing out $3.8 billion in August to boost its 10 percent stake in a Canadian seller of marijuana products Canopy Growth Corp <WEED.TO> to 38 percent.